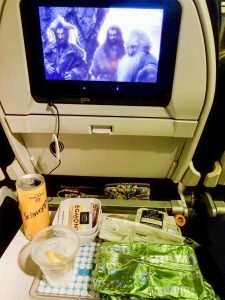 This is our Air New Zealand Review flying Edmonton To New Zealand from our February 2018 trip. 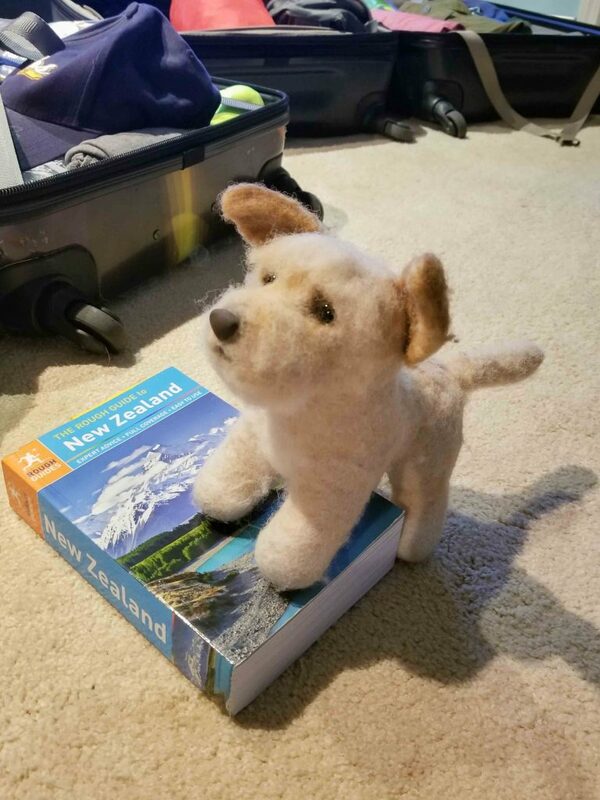 It was our first time flying with Air New Zealand, but New Zealand has always been on our list of travel destinations. We always assumed we would do New Zealand and Australia in one big trip, and had resigned ourselves to waiting until we could somehow manage to take 2 months away from Edmonton and our business. 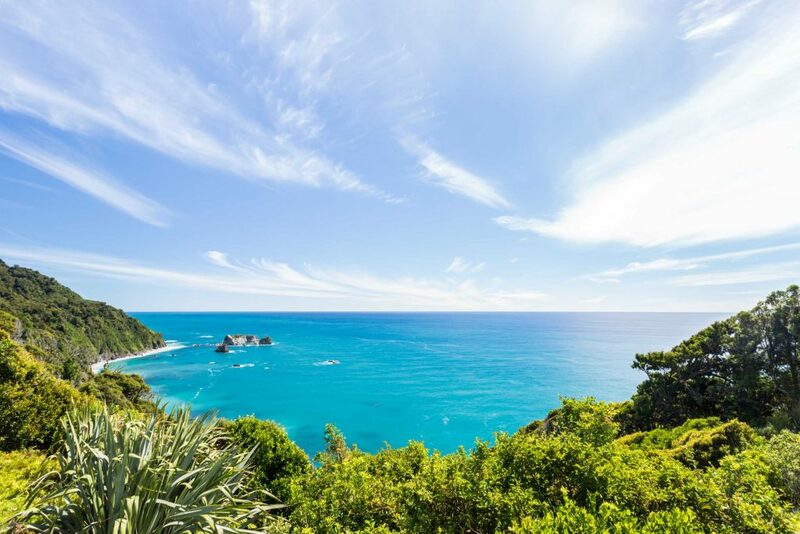 Luckily, we found some amazingly cheap and convenient flights from Edmonton to Auckland with Air New Zealand during a time when we had a break between weddings and could take 2.5 weeks off! 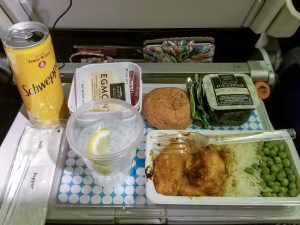 To sum up our Air New Zealand review; travelling with Air New Zealand was a delight. If you want to read the full Air New Zealand review, please continue reading! There was only one stop, which was in Vancouver and even though we had a 2 hour flight delay in Edmonton due to weather, we still had a 2 hour break in Vancouver to get ourselves ready for the 14 hour overnight flight. 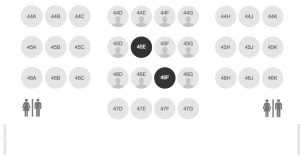 We flew economy, but paid a little extra to select our seats ahead of time. We managed to get two awesome seats in the last row of the 3rd section. This meant we could lay our seats back a lot further than the people ahead of us, and it made a MASSIVE difference when it came time to sleep. Normally we are both unable to sleep on planes, but we both managed to get 6-8 hours on both flights. Having nobody behind us, and extra room to recline our chairs was awesome. We were given complimentary blankets and pillows. We both had our Bose noise cancelling headphones, so we didn’t use the free ones they gave us, but it was a nice gesture. All of the staff were incredibly kind, patient, and polite. The in-flight entertainment was very good – the screens were large and easy to use. The movie selection was very good, with lots of new and old movies to chose from. There were also lots of TV shows, music and games available. There was no power outlet in our seats, but they did have a USB charger port. Air New Zealand In Flight Entertainment. One neat feature of the in-flight entertainment was the screen share option. This let the two of us watch the same movie at the same time on our own screens. Sunny found this particularly convenient because when the entire cabin is dark, the screen of the person sitting next to you can sometimes be distracting. We both watched The Hobbit – An Unexpected Journey prior to and during dinner. After dinner Sunny watched Thor: Ragnorak while Jess dozed away listing to podcasts. 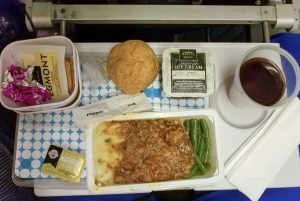 We were fed twice on the plane – our first meal was about 2 hours into the flight. Sunny had the beef stew, which was a little tough and chewy, but flavourful. Jess had the chicken which was seasoned nicely with Indian spices. The portion sizes were decent, perfect for Jess and a little small for Sunny. We each had a glass of complimentary wine – there was also beer, champagne and spirits free of charge. 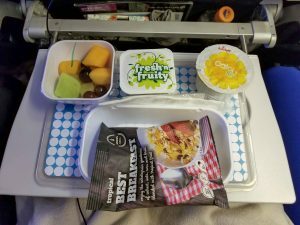 The second meal was breakfast and served with around 2.5 hours left in the flight. We both ordered the fruit platter, which was a few pieces of melon, half a canned peach, some grapes and a few orange slices. It came with yoghurt and a muffin. It wasn’t a great breakfast, but did the trick for us as neither of felt like anything too heavy. We did supplement it with some granola bars we had brought with us. The other option was a hot breakfast option of an Italian omelette. 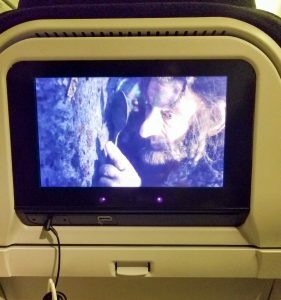 Another cool feature of Air New Zealand is that after the meal service, you can use your in-flight entertainment screen to order drinks and snacks. 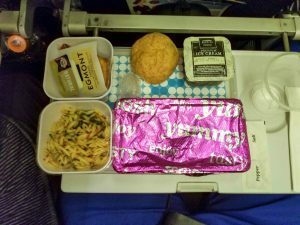 You don’t have to buzz the flight attendants, you can just do it all from your seat and the flight attendants will bring whatever you ordered right to you fairly quick. After dinner and a couple of movies (about 4 hours into the flight), we both decided it would be a good time to try to get some sleep. We snuggled in our blankets, put our headphones on, lay our seats back, and put on our eye masks. After dinner, the crew turned all the lights off inside, which definitely helped us fall asleep. We both managed to fall asleep and stay asleep for a decent amount of time. We would wake up occasionally, but overall we both probably managed a solid 6 hours of sleep and a good 8 hours of sleep + rest. Sunny woke up just as they were about to serve breakfast and turn all the cabin lights back on. After breakfast, it wasn’t long before we began our descent towards Auckland. 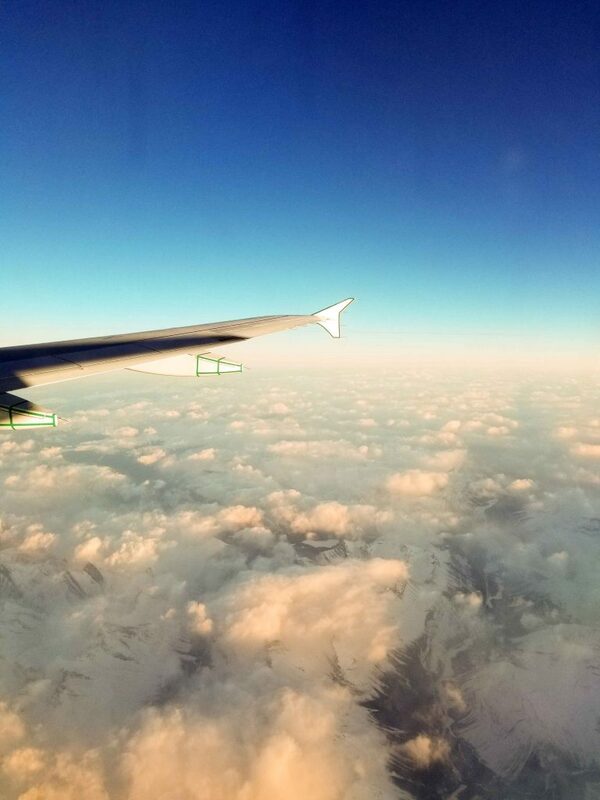 We landed around 5am, and by the time we taxied to the gate and disembarked the plane it was 5:30. We breezed past the first New Zealand customs checkpoint using the automated kiosks, grabbed our luggage (which arrived fairly promptly) and then made our way to the second Customs checkpoint. The second checkpoint took about 15 minutes to get through. At this stop everyone had to talk to a customs agent about whether they brought ANY food into the country. Apparently the Kiwis are very strict about this, and will gladly hand out fines to those who lie, forget or misrepresent what they are bringing into the country. Be honest (like us!) and it will be quick and painless. We told them we had granola bars and maple syrup (we brought 10 small bottles to give as gifts to the AirBnb hosts we stayed with), and he let us on our way.